The Carbery academy players received jerseys during the week following their participation in Carbery academy development squads during the year. 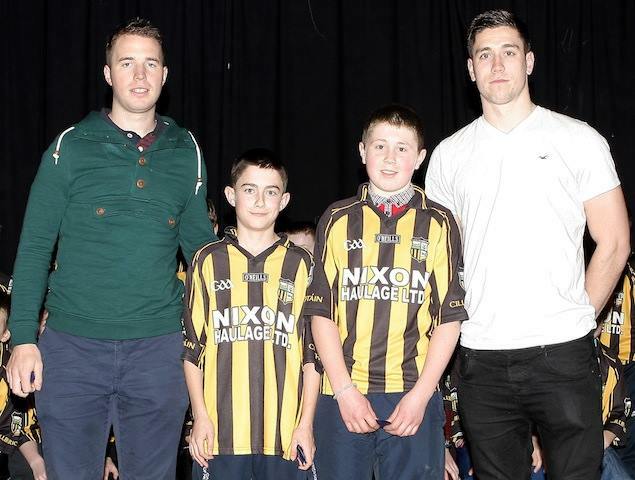 Pictured at the function were Donagh Galvin, Gavin Kenny, Conor Hogan, Sean Sexton and Eoin O'Donnell. On Thursday evening the Kilbrittain under-age annual general meeting took place. The following committee were put in place for the coming year. Chairperson Niall Crowley, Vice Chair Helen Butler, Secretary Eileen Kenny, Assistant Secretary Judy Sexton, Treasurer Mary Egan, Assistant Treasurer Breda Hogan, PRO Mary Brennan, Development Officer John Considine. The best wishes of the adult club to all the under-age officers for 2016. Well done to all who took part in the 'Halloween' sponsored walk on Saturday last. Prizes for the best costumes went to Fionn Ustianowski, Leon Keaty, Fionnuala Gillain, Adam Desmond and CJ Bryan. Prizes for most money collected went to Zack Edgerton and Jack O'Neill. Prizes for fastest runners went to Gavin Kenny, Donnacha O'Mahony and Daniel Dollard. Well done to all and thanks to everyone who supported the walk. Anyone who couldn't make it on the day can drop their sponsor card and money into the Post Office. The underage Annual General Meeting will be held on Thursday 12th Nov @ 8.30 in the meeting room in the community hall. All are welcome. subs Luke Griffin, Leon Keaty, James Ahern and Alan Harrington. Following a very successful year, winning the divisional championship and reaching the county final, the u14 hurlers finished the season on a high note on Sunday morning last in the league final where they defeated Western Gaels in Kilbrittain, 4-14 to 0-7. Kilbrittain played with the wind in the first half and led 4-10 to 0-1 at half time. Adding on 0-4 to Western Gaels 0-6 in second half they captured the league title to huge celebrations. The scorers were Mark Hickey (0-8,) Sean Sexton (1-2), Spenser Keaty (1-1), Darragh Considine (1-0), Donagh Galvin(0-2) and Donnocha O' Mahony (0-1). ​Captain CJ O'Connell received the plaque from Fergal Keohane, Rebel Og west. The U14 hurlers travelled to Ballinlough to play Lisgoold in the U14 B County final on Saturday afternoon last. Kilbrittain had an impressive run to the final defeating Ballinascarthy, St.Fachtnas and Western Gaels to capture the 'West' title. They then beat Kinsale in the county semi-final. On this occasion however, they came up second best with Lisgoold winning 3-11 to 0-9. Kilbrittain held their own during the first half although they went in at the break 1-7 to 0-6 down. The two second half goals put the game beyond them although they battled hard right to the end. Mark Hickey was the main scoring threat for Kilbrittain with eight points, six from frees while Seamus O'Sullivan added the ninth. They can be proud of their achievement of winning the division title and reaching the county final. Team: Cathal O'Sullivan, Dylan Butler, Gavin Hodge, Colm Sheehan, Donnagh Galvin, Gavin Kenny, Calum O'Donnell, Sean Sexton, Darragh Considine, Conor Hogan, Mark Hickey 0-9, (0-6 frees), Spencer Keaty, CJ O'Connell, Jason Harrington, Seamus O'Sullivan 0-1. Subs used: Eoin O'Donnell, Donnacha O'Mahony, Killian O'Connor, Connor Ustianowski, Eoin O'Neill. Rest of panel: Shane O'Conner, Mark O'Shea, Charlie Kenny, Mikolaj Kalittka. 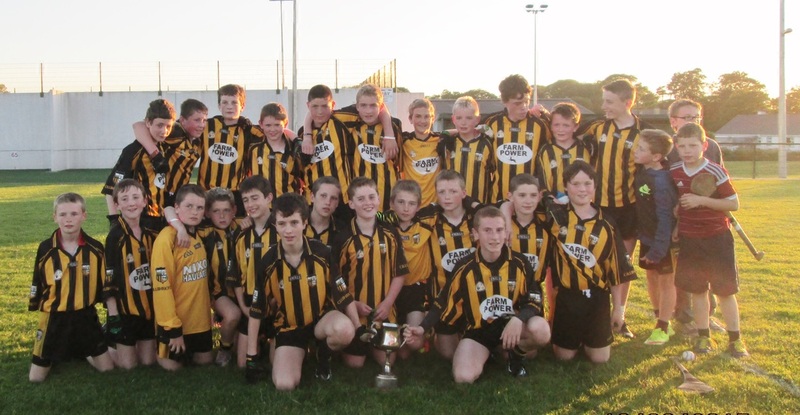 The U14 hurlers defeated Kinsale in the semi-final of the county in Newcestown on Saturday evening 3-6 to 2-6. Kilbrittain led at half time 3-4 to 1-1. Kinsale came back strong in the second half and added on 1-5, but Kilbrittain held their nerve and kept a distance between the teams with two crucial points. Scores coming from CJ O' Connell 2-1, Mark Hickey 0-5,(2f). and Seamus O' Sullivan (1-0) As well as the scorers, Colm Sheehan, Spenser Keaty, Dylan Butler and Donagh Galvin all played well. They now look forward to the county final.Earlier in the day the minor B hurlers met Sam Maguires in the west cork final in Bandon. Kilbrittain had a great opening half and built up a 2-8 to 1-5 lead by halftime. Philip Wall the provider of the two goals the second following a great pass by Tomas Sheehan. Kilbrittain failed to turn up in the second half as Sam Maguires took control scoring a questionable 'square goal' in the seventh minute to get right back into the game. While a couple of frees brought Sam Maguires level, the real knock out blows were two long range efforts that both ended up in the back of the Kilbrittain net in the 21st and 22nd minutes. With most of the team minor again next year, they will learn from this experience. Team: Ian Hodge, Shane Sweetnam, Sam Dewey, Darren Burke, Dylan Twohig, David O'Neill, Evan O'Donovan, Josh O'Donovan 0-1, Tadgh Kearney, Sam Shorten, Ryan Lombard, Patrick O'Mahony 0-3, 0-1free, Philip Wall 2-2, Tomas Sheehan 0-1, Morgan Madden. subs used Ciaran Byrne, Bertie Butler, Sean O'Brien. The under 12 hurlers defeated St Colums on Sunday morning in Kilbrittain 2-10 to 4-0 in the championship plate final. The top scorer was captain Eoin O'Neill with 1-5, Ronan O'Beirne 1-0, Donnacha O'Mahony 0-2, Mark O'Shea 0-2 and Ronan Crowley 0-1 provided the other scores. Kilbrittain U14 hurlers had a great win over Western Gaels in the West Cork championship final on Thursday evening in Newcestown. 3-9 to 0 -7. A great ball in by Calum O' Donnell was flicked to the net by Jason Harrington in the first minute and points by Darragh Considine Sean Sexton Conor Hogan,and Mark Hickey (2) left the half time score 1-6 to 0-2.With a minute gone in the second half Sean Sexton scored a goal after a good solo run from midfield and Mark Hickey free soon after went all the way to the net. Western Gaels were awarded a penalty but a great save by Cathal O' Sullivan in goal flicked it over the bar. Cj O' Connell, Mark Hickey and Seamus O' Sullivan added on points with time up .The cup was presented to Calum O' Donnell (cpt ) by Fergal Keohane Rebel Og Delegate. Team. Cathal O' Sullivan, Dylan Butler, Gavin Hodge, Colm Sheehan, Donagh Galvin, Gavin Kenny, Calum O' Donnell,(Cpt), Sean Sexton(1-1), Darragh Considine (0-1), Conor Hogan(0-1),Mark Hickey(1-4), Spenser Keaty, CJ O' Connell (0-1), Jason Harrington(1-0), Seamus O' Sullivan(0-1), Subs Eoin O' Donnell, Shane O' Connor, Killian O' Connor, Donnocha O' Mahony, Mark O' Shea, Mikolaj Kalittka, Conor Ustianowski, Charlie Kenny, and Eoin O' Neill. The U12 footballers were defeated by Bantry 2-15 to 2-9 at home recently .Meanwhile the U12 hurlers defeated Barryroe in Barryroe last friday evening 3-1 to 0-7. The goals coming from James Ahern, Conor O' Mahony and Conor Ustianowski and the point from Eoin o Neill. The minor footballers defeated Newcestown at home on Sunday morning 2-8 to 1-6. The scores coming from Patrick O' Mahony (0-4), Dylan Twohig (1-0), Morgan Madden (1-0), Bertie Butler (0-2), Ciaran Byrne and Aaron Holland one point each. On Monday evening the Minor hurlers met St Fachtnas in the semi-final played in Clonakilty. Kilbrittain were well on top in this game. They established an early lead 1-4 to 0-2 by the fifteenth minute. Josh O'Donovan with the goal. Patrick O'Mahony was unerring from frees and O'Donovan got his second goal with eight minutes to the break. At the other end Sam Dewey and Dylan Twohig were solid and Ian Hodge made a fine save from a goalbound shot with four minutes left and any comeback before halftime from St Fachtnas was squashed when Philip Wall got Kilbrittain's third goal following a great pass from O'Donovan to make it 3-7 to 0-4 at halftime. Kilbrittain carried on from where they stopped at the start of the second half with points from O'Mahony, Morgan Madden, Philip Wall to make it 3-15 to 0-5 at the halfway stage. Credit to St Fachtnas They never gave up and finished strong with points from Sean O'Reilly, Christopher Prendergast and Aaron O'Flynn added to a well taken goal from the hard working Cathal Hennessey. Despite the late revival, Kilbrittain kept the scoreboard ticking over also with scores from O'Mahony, Darragh Moore, Morgan Madden and Ciaran Byrne. Wall finished a fine move to the net for his second goal with six minutes from time. It finished Kilbrittain 4-19 St Fachtnas 1-10.Team Ian Hodge, Shane Sweetnam, Sam Dewey, Darren Burke, Dylan Twohig, David O'Neill, Evan O' Donovan, Josh O' Donovan (2-1), Tadg Kearney, Sam Shorten, Patrick O'Mahony (0-13, 0-7 frees, 0-1 '65), Ryan Lombard, Philip Wall (2-1), Tomas Sheehan, Morgan Madden (0-2), Subs Ciaran Byrne (0-1), Eoghan Byrne, Darragh Moore (0-1), Oisin Dewey, Bertie Butler, Nick Ustianowski, Sean O'Brien, Aaron Holland, and Eoghan Galvin. Meanwhile the U14 hurlers defeated St Fachtna's in the semi -final of the B championship last Thursday evening in Ahiohill 4-19 to 2-0, Scores coming from Mark Hickey (1-7, 4f), Spencer Keaty(0-5), Sean Sexton (0-4), Conor Hogan (1-0), Seamus O' Sullivan (1-0), Jason Harrington (1-0), and Darragh Considine, Donagh Galvin, and CJ O' Connell getting a point each. They now meet Western Gaels or Ahan Gaels in the West Cork final coming up soon. (6frees), Philip Wall (0-3), Tomas Sheehan (0-2) with Josh O' Donovan an Ryan Lombard getting one each.All players played well on a great win but Sam Dewey at the back had an outstanding game. The U14 hurlers defeated Pedlars in the championship on Thursday evening in Ahiohill 5-14 to 4-3. Kilbrittain led at half time 4-7 to 1-1 and added on 1-7 to Pedlars 3-2 in second half. The scores coming from Seamus O' Sullivan (3-1), Jason Harrington ( 2-1), Mark Hickey 0-9, Donagh Galvin, Sean Sexton and Spencer Keaty one point each. They now play St Fachtna's in the semi final on Thursday 20th in Ballinscarthy. Time to be confirmed so check locally before travelling. Cul Camp 2015 was held in conjunction with the festival. A fantastic four days filled with quality training and lots of fun! Sixty three boys and fifty girls between the ages of 6 and 13 from the community took part. Well done to all the children for turning up rain or shine. The camp was a great success and this would not have been possible without the help and enthusiasm of the many adults and teenagers who gave up their time to help and for this the club is very grateful. A special note of thanks to John Considine for sourcing our main trainers and for all his hard work behind the scenes. 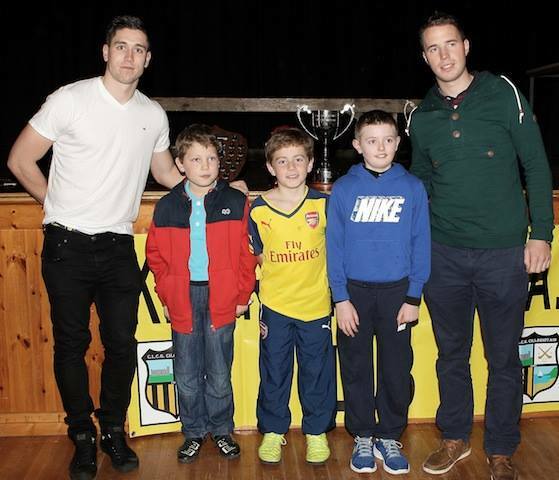 Jamie Wall, Conor Lehane, Alan Cadogan and Cormac Murphy were among the special guests. The U14 footballers were defeated by Urhan in the league semi-final on Sunday morning in Aughaville 4-9 to 2-12.Meanwhile the U14 hurlers had a good win over Ibane Gales in the league in Timoleague with a score of 3-18 to 1-8. The top scorer was Mark Hickey with 12 points (7 frees).Team Cathal O'Sullivan, Colm Sheehan, Gavin Hodge, Mikolaj Kalitka, Darragh Considine, Gavin Kenny, Dylan Butler, Sean Sexton (0-1), Calum O'Donnell, Conor Hogan, Mark Hickey (0-12), Spencer Keaty (0-1), CJ O'Connell (2-0), Jason Harrington (0-2), Seamus O' Sullivan (0-1). Subs Killian O' Connor (0-1), Conor Ustianowski, Mark O' Shea, Eoin O' Donnell, Charlie Kenny, Donnocha O' Mahony, and Eoin O' Neill. The U16 hurlers were defeated by Pedlars in the championship in Bandon on Friday evening. Pedlars were up 1- 6 to 0-4 at half time with the Kilbrittain scores coming from Bertie Butler,two frees and two from play. Bertie added another two points in the second half to take his total to 0-6. Sam Dewey (0-1), Tomas Sheehan (0-1), and Philip Wall (0-2), added on the points in the second half. Pedlars added on four points in the second half to leave the final score Pedlars 1-10 Kilbrittain 0-10. Eoin Galvin in goal, and the Dewey brothers were others who played well. The U16 Hurlers defeated Western Gaels in the championship on Sunday evening in Newcestown 2-11 to 2-8. Western Gaels had two goals in the first ten minutes before Kilbrittain got a goal from Sam Dewey and points from Bertie Butler(1) and Philip Wall,(2) to leave the halftime score 2-3 to 1-3 in favour of Western Gaels. Kilbrittain added on a goal and eight points in the second half to Western Gael's five points. Tomas Sheehan, Philip Wall, Eoghan Byrne, Sam Dewey, and Padraig Galvin, all played well.Team Eoghan Galvin, Jack o Donovan, Oisin Dewey, James O' Donovan, Kieran Murphy, Eoghan Byrne, Padraig Galvin, Tomas Sheehan (1-4), Bertie Butler (0-3), Gavin Hodge, Sam Dewey (1-1), Sean Sexton, Aaron Fehilly, Philip Wall (0-3), Aaron Holland. Subs Gavin Kenny, Darragh Considine, Mark Hickey, Kynan O'Hara, Jason Harrington, CJ O'Connell. Calum O'Donnell, and Cathal O'Sullivan, The U13 hurlers were defeated by Bandon in the league 0-8 to 1-3. The game was played in Bandon. The U16 hurlers were defeated by Bandon in Bandon on a score of 3-9 to 1-12. Team: Eoghan Galvin, James O' Donovan, Oisin Dewey, Jack O' Donovan, Padraig Galvin, Sam Dewey, Darragh Considine, Tomas Sheehan (0-1), Bertie Butler (1-1), Mark Hickey (0-1), Philip Wall (0-7), Sean Sexton (0-1), Jason Harrington, Kynan O' Hara (0-1,) and Gavin Kenny. The minor hurlers were defeated by Ibane Gaels in Kilbrittain, 3-14 to 3-11. The scores came from Josh O'Donovan (2-2), Patrick O' Mahony (0-5)3f, Sam Shorten (0-2), Darragh Moore (1-0) and Bertie Butler (0-2).Also on Friday evening the minors hurlers with a lot of players on holidays, were defeated by Ahan Gaels 5-15 to 0-5, the points coming from Sam Shorten (2), Philip Wall, Josh O' Donovan, and Morgan Madden. 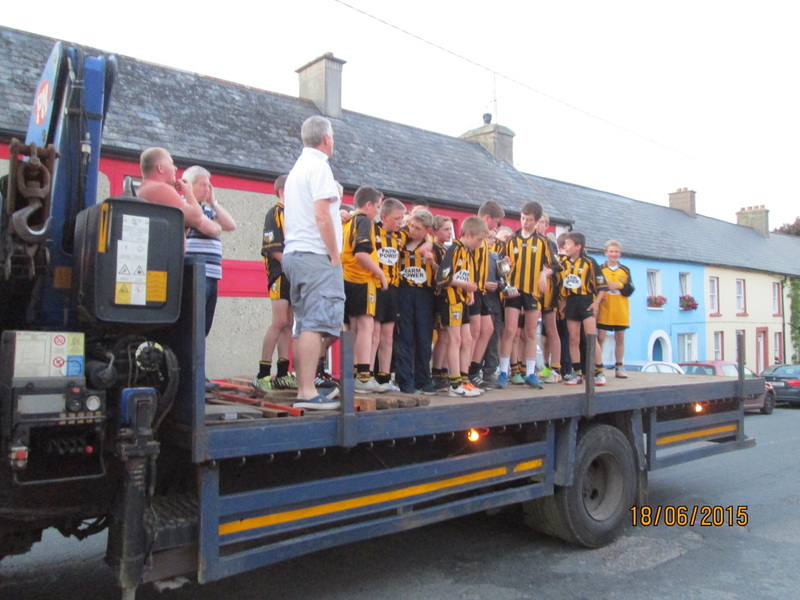 Kilbrittain U14 footballers having won the west Cork championship recently, were defeated by a strong Crosshaven team in the County semi -final on friday in Macroom. The final score read 4-7 to 0-9. Crosshaven led at half time 2-4 to 0-5, the Kilbrittain scores coming from Conor Hogan 0-2(frees) Gavin Kenny, Mark Hickey and Seamus O' Sullivan. Crosshaven added on 2-3 with Kilbrittain's 0-4 coming from Mark Hickey 0-3, (0-2frees) and Conor Hogan. The U14 footballers had a good win over St Oliver Plunkets in Ballinascarthy during the week in the west cork final, 4-7 to 1-7. Captain Gavin Hodge received the cup from Aiden O’Rourke, Bord na nOg. The team included, Mikolaj Kalitka, Colm Sheehan, Donagh Galvin, Mark Hickey, Daragh Considine, Kalem O’Donnell, Gavin Kenny, Sean Sexton, Gavin Hodge, Conor Hogan, Jason Harrington, CJ O’Connell, Seamus O’Sullivan, Cathal O’Sullivan, Donnacha O’Mahony, Dylan Butler, Killian O’Connor, Conor Ustinowski, Charlie Kenny, Spencer Keaty, Eoghan O’Donnell, Shane O’Conor, Mark O’Shea and Eoin O’Neill. The u12 hurlers were defeated by Clonakilty in a league game at home 2-5 to 1-2. Kilbrittain's goal coming from Ronan Crowley and points from Eoin O'Neill. Good performances from Mark O'Shea, Corey Casey and the Ustianowski brothers. The u13 hurlers had a great win over Bandon at home last Saturday evening winning on a score of 4-3 to 2-7. Half time score was Bandon 1-5 Kilbrittain 1-1,Kilbrittain's goal coming from Conor Hogan and point from a Sean Sexton free. In the second half goals came from Conor Hogan (1-0), Donnocha O'Mahony (1-1) and Sean Sexton (1-1). There were good performances from Cathal O'Sullivan in goal, Colm Sheehan and Dylan Butler. The Minor hurlers finished their non-exam games with a win away in Ballyhooly against Blackwater Rovers. on a score of 1-17 to 2-09. The U12 footballers were defeated by St Colums at home on a score of 6-3 to 5-5.Colums led at half time 4-2 to Kilbrittain's 1-2. Ronan Crowley getting the goal and points from Eoin O' Neill and Conor Ustianowski. Kilbrittain added on 4-3 to Colums 2-1 in the second half, but Colums held on for a victory. Mark O' Shea, Corey Casey, Ronan O' Berine and Owen McCarthy played well for Kilbrittain.The u14 footballers had a great victory over Gabriels in Ballydehob on Thursday evening 4-14 to 6-4. 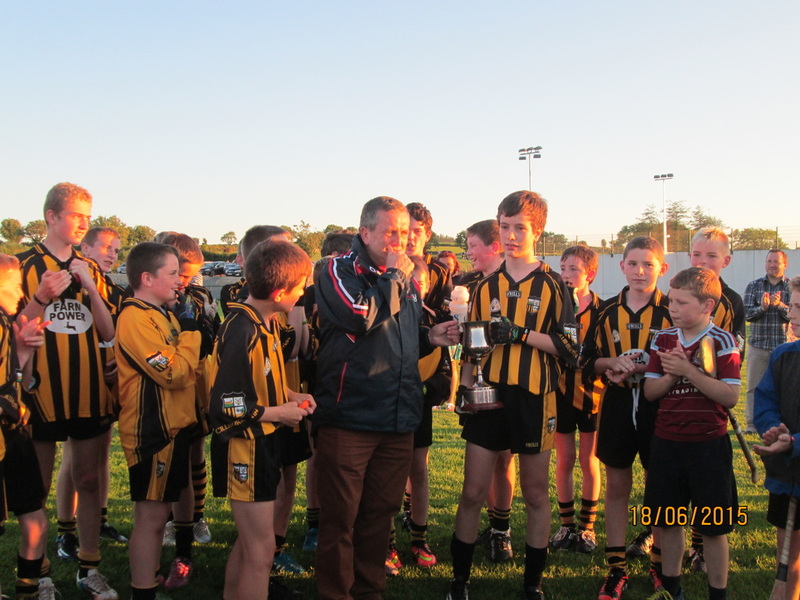 The u13 hurlers defeated Barryroe on Saturday 0-10 to 0-8 in Barryroe. Barryroe led seven points to five at half time. Kilbrittain points from Sean Sexton(2), Gavin Kenny, Eoin O' Neill, and Conor Ustianowski. Sean Sexton added on (5points, 3frees) to Barryroe's 1 point. Fionn Ustianowski Colm Sheehan,Dylan Butler, Mark oO'Shea and Killian O' Connor played well. 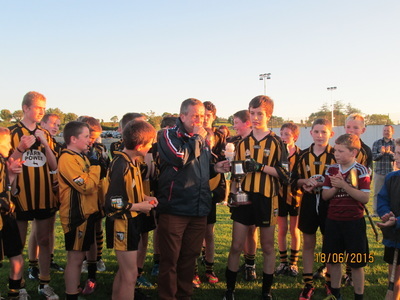 The U14 footballers played Plunketts in Kilbrittain and were defeated. Kilbrittain 3-11 Plunketts 3-14. Plunketts were up 1-7 to 0-5 at half time. Plunketts added on a further 2-7 in the second half to Kilbrittains 3-6. In the non-exam league Kilbrittain were defeated by Ballinora at home 3-13 to 2-6. 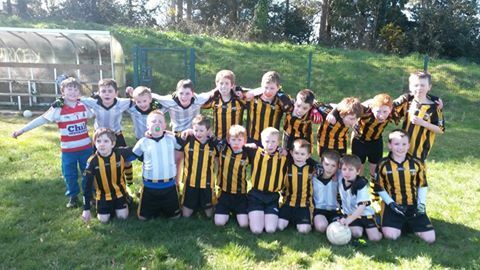 The U10 players had a blitz in Kilmeen on Saturday morning. All played well. Photo: From top left, Karol Egan,Keith Hunt,Owen Mcarthy, Shay Fehilly O'Brien, Ronan Crowley, Fionn Ustianowski. From bottem left, Luke Griffin, C.J Bryan, John Ryan, Jack Lombard, James Ahern. The u16 footballers were defeated at home in the league by Pedlars 6-14 to 1-6.The u14 hurlers had a good win away in Kealkill against St Colums 5-12 to 2-1.Meanwhile the Minor hurlers played their first game in the non exam league on Sunday evening in Donoughmore and were unluckey to be defeated 4-7 to 2-11.Panel Ian Hodge, Evan O' Donovan, Dylan Twohig, Darren Burke, Eoghan Byrne, Josh O' Donovan, Shane Sweetnam, Tadg Kearney, Patrick O' Mahony, Darragh Moore, Ryan Lombard, Ciaran Byrne, Morgan Madden, Sam Dewey, Philip Wall, Bertie Butler, Oisin Dewey, Sam Shorten, Aaron Holland,Nick Ustianowski, and Eoin Galvin. The u12 hurlers were defeated by Bandon in a league game 4-5 to 1-4. The goal coming from Ronan O'Beirne and points from Donnacha O'Mahony, Ronan Crowley and Eoin O'Neill. The u14 footballers defeated Kilmacbea at home on Sunday morning 6-10 to 2-1. The u16 hurlers had a great win over Ahane Gales last Monday evening in Enniskeane 1-13 to 2-5. The goal coming from Aaron Holland and points from Sam Dewey (0-2), Philip Wall (0-5) and Bertie Butler (0-6). The U14 hurlers defeated Pedlars on Saturday morning in Ballinscarthy 1-7 to 0-5 and drawing with Tracton 0-3 to 1-0, they won the group and qualified for the semifinal on Sunday against Youghal in St Finbarrs grounds in Togher.They came up against a strong team and were defeated 2-3 yo 0-4 all the points coming from Mark Hickey. Well done to all involved in getting to semi final. Panel Cathal O' Sullivan, Mark O' Shea, Dylan Butler, Gavin Hodge, Kalum O' Donnell, Sean Sexton, Colm Sheehan, Mark Hickey, Gavin Kenny, Donagh Galvin, Spencer Keaty, Darragh Considine, Conor Hogan, Seamus O' Sullivan, CJ O' Connell, Jason Harrington, Donnocha O' Mahony, Conor Ustianowski, Mikolaj Kalitka, Killian O' Connor, Eoghan O' Donnell, and Shane O' Connor. The minors played Bandon in hurling and football and were defeated in both games.The u16 Hurlers had a great win over Pedlars last monday evening in Ballinscarthy 4-12 to 3-12 Pride of place goes to Bertie Butler who scored 2-11 on the night. The other scores came from Kynan O' Hara and Philip Wall. The U16 Hurlers defeated Newcestown in a league game last Monday evening winning on a score of Kilbrittain 6-14 to 0-9 for Newcestown at home. Team Eoin Galvin Jack O' Donovan, Oisin Dewey,James O' Donovan, Padraig Galvin, Eoghan Byrne, Darragh Considine, Tomas Sheehan (0-2), Sam Dewey,Kieran Murphy, Bertie Butler(0-5), Philip Wall(5-5), Aaron Holland(0-1), Kynan O' Hara(0-1), and MarkHickey, Subs Gavin Hodge (1-0), Jason Harrington, and Aaron Fehilly.Meanwhile The u14 hurlers defeated Ballinscarthy away on Saturday evening winning on a score of 2-8 to 1-8.Team: Cathal O' Sullivan, Dylan Butler, Gavin Hodge, Shane O' Connor, Colm Sheehan, Darragh Considine,(0-1), Kalum O' Donnell, Mark Hickey(0-2), Sean Sexton, Spencer Keaty(0-3), Gavin Kenny, Conor Hogan(1-0), CJ O' Connell, Jason Harrington(1-1), and Seamus O' Sullivan, Subs Killian O' Connor Donnocha O' Mahony(0-1), Mark O' Shea and MIkolaj Kalitka. Next weekend the u14 Hurlers will be out again the start of the Feile competition with Pedlars and Tracton in their group a venue yet to be decided. Boston Tea Party will take place next Saturday the 28th March 2015. Great night assured!!!!! The Kilbrittain Minor Footballers played Pedlars in a league game in Ballinscarthy on St Patricks morning and lost on a score of 8-15 to 3-3. The scores came from Patrick O'Mahony (1-2), Morgan Madden (1-0), Ryan Lombard (1-0) and Josh O'Donovan (0-1). The U16 Footballers played a league game against Western Gaels on Sunday afternoon in Kilbrittain losing on a score of 5-11 to 2-7. The halftime score was Western Gaels 2-8 Kilbrittain 1-4. The scores came from Ph...ilip Wall (1-3), Bertie Butler (0-3), Aaron Holland (1-0) and Aaron Fehilly (0-1). There were good performances from Philip Wall, Darragh Considine and the Dewey brothers. Team: Kynan O'Hara, Oisin Dewey, Jack O'Donovan, Gavin Hodge, Eoghan Byrne, Darragh Considine, Eoin Galvin, Bertie Butler, Sam Dewey, James O'Donovan, Mark Hickey, Aaron Holland, Kieran Murphy, Philip Wall, Aaron Fehilly, Padraig Galvin and Jason Harrington. U10 Football Blitz in Bandon on Saturday 21th March. All had great fun! Congratulations to the Scor na bPaisti Ballad group of Fionnuala Gillian, Olivia Tuthill, Katie Murphy and Ellen Murphy who won the ballad Group competition in Ballydehob. They now go forward to the County finals on 6th March in Ovens. Well done to all involved. Best of luck to the Scor na bPaisti Ballad group of Fionnuala Gillian, Olivia Tuthill, Katie Murphy and Ellen Murphy who having qualified from the semi-finals last weekend, go forward to represent the club in the Carbery finals in Ballydehob on Sunday next 15th February. Competitions start at 2pm. 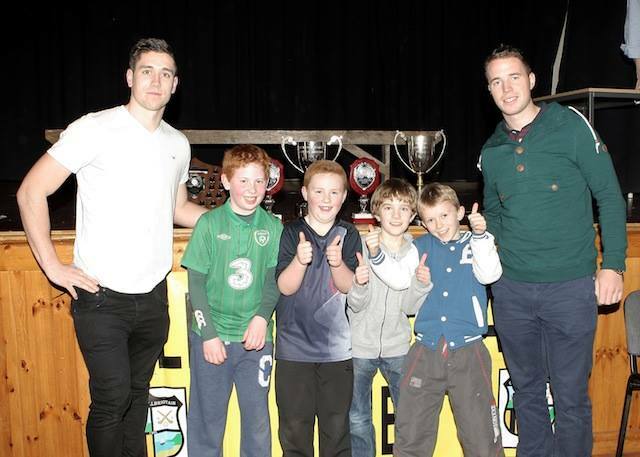 Cork county footballers Colm O'Neill and Conor Dorman visited Kilbrittain recently for medal presentations.